Bamboo flutes are instruments made from natural materials that have been used across the world. For centuries, people have played flute music to relax or lift their spirits. There is something about music that has the ability to make you feel happy, remind you of something sad, liven you up, or send you to sleep, it even has the ability to frighten you! Two of the most common ways of making music are through banging or knocking on something as in drumming, or through the use of wind and blowing. 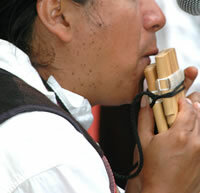 The flute is among the oldest musical instruments and exist in nature without the interference of people. We all know, and have experienced, the sound of the wind whistling through natural objects, people have just taken what nature provided one step further and manipulated materials to create sounds according to their taste. One of the unique qualities of these instruments is that they are played with breath and because of that no one person will play one in the same way. Each person will create a unique sound and give the music their energy from within. Apart from that, every flute is different in its own right and has its own personality and characteristics from when it is created until it grows old with playing. The bamboo and the maker will also have put their own uniqueness into the instrument. The tone of the instrument is dependant on the maker, the player, and the bamboos characteristics.